You've all seen them. Maybe you were visiting a giant toy store or walking through an amusement park and you saw, out of the corner of your eye, a giant dragon lurching out of a pond or a perfect miniature recreation of the Parthenon sitting on a pedestal. Upon closer examination, you notice that they were built entirely out of toy blocks, out of goddamn Legos. You no doubt spent a few minutes marveling at these creations only to go about your business afterwards, not giving much thought to what it really takes to create such a thing. 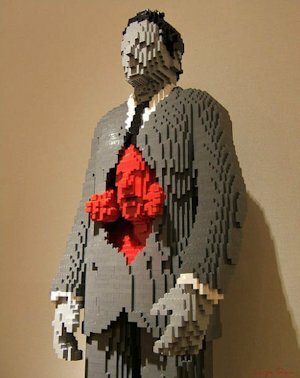 But the truth is it only requires two things: the Legos, and madness. Like most men my age and younger, I grew up playing with Legos, but my creations were never more complicated than the instructions that came with them or the occasional improvised spaceship that was only about a hundred pieces in total. As a teenager, I once helped my brother build a large-scale Star Destroyer out of Legos--following an instruction manual--and that was probably the most elaborate LEGO® project I had ever committed to. That is, until about three weeks ago. I now understand. I get it. I know why somebody once built a 1:1 scale model of a Volvo XC90, and I comprehend what it took to get there. What follows is a rough outline of my experience--and the experiences of thousands of others who have been through it--into what I am hereby dubbing "LEGO® Lunacy." It starts out innocently enough, with the purchase of a single LEGO® kit. It could be big or small, anything from a $7 surfer with a jet ski and a shark to a $30 starter kit or, for rich kids, a $320 Sydney Opera House. As the youngest of three boys, I don't remember our first LEGO® set, which was probably purchased before I was even born, but I can say that we got a lot of Legos. 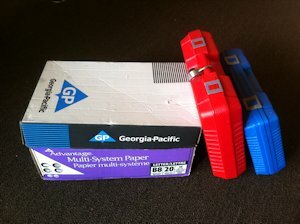 We were like little drug addicts, begging and pleading with our suppliers--our parents--whenever we needed our next fix. With all three of us getting new sets and going through occasional periods of intense Lego-ness, by the time we had all moved out, we had amassed an enormous collection, and somehow--probably because I was the last to move out--I wound up with the bulk of it. I'm not going to brag or try to argue that my collection is bigger than most, because I'm sure there are plenty of collections that are even more ridiculous out there, even among my circle of friends. But sufficed to say, when I unearthed and dusted off the collection to celebrate my son's fourth half birthday (that's how we deal with the fact that his regular birthday is so close to Christmas), it filled two LEGO®-brand suitcases and a giant box that was originally designed to hold ten reams of printer paper. Though I'm attempting to be modest about the size of this hoard, I would not describe it as "modest" in any way. In fact, if you were to put a dollar value on it, I could probably buy a decent used car for the same amount. While Tommy, my four-and-a-half-year-old, was figuring out how to put three or four bricks together to form an amorphous, multicolored blob, I decided to show off by building the kind of improvised spaceship I used to build when I was a kid. I didn't start out with any kind of plan in my head; I just dug my hands into the box of Legos, pulled out pieces that looked good, and put them together into the rough shape of a spaceship. 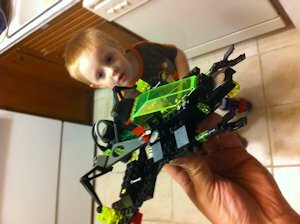 When I was finished, my son was thoroughly impressed and wanted to play with it. This caused some distress, because I knew that he would, in short order, reduce my creation to its constituent parts and litter them onto the floor (where I would later step on them), a crucial part of the LEGO® experience. I also knew that I should let him, because I wanted him to experience all the joy that Legos have to offer. After all, I had built it for him... hadn't I? My desire to make him happy won out in the end, and he did, eventually, destroy the spaceship. A part of me felt a pang of loss, but really, I built the thing in half an hour and could easily do it again, so what had I lost? It's not like I put a whole lot of time and effort into building anything truly amazing. This is where you cross the border into more dangerous territory. At some point, it will occur to you that you have unwittingly developed a special set of skills and that, if you put your mind to it, you could probably build something awesome. Then the lightbulb will flash above your head--that singular idea will take hold--and you'll find yourself thinking, "Maybe I'll just build a small part of something, just as a proof of concept, as a way to prove to myself that I could do it." 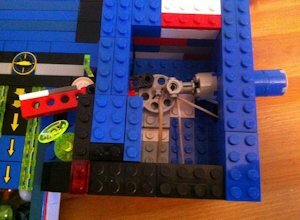 For me, the idea was to build a pinball machine out of Legos, a basic version of which I had seen in passing on YouTube once, and the small part that I started with was a pinball launcher. The plan took hold late at night, when I was trying to sleep, when it occurred to me that I could harvest a small spring from a pen and use that as the underlying mechanism to launch pinballs (marbles, actually, as my son has them in abundance) down a small pathway.